We weren’t in the market for a new bird (really, who is?). But, alas, here he is. Funny story how we got this bird. We were shopping in a local outdoor shopping center and Gia sat in her stroller and behaved for nearly a half hour. (That’s like forever in 2-year-old time.) She asked to go see the fishies, so I took her into Petco. We do this often and have never had any problems. We walk around, check out all the animals and then leave. Without any animals. You see where I’m going with this, right? Well, after visiting the ferrets, mice, hamsters, fish, frogs, snakes, and birds, we were ready to go home. Well, I was anyway. Gia had other plans. She had her eye on a blue bird in a cage with twenty other green and yellow parakeets. Just as I was about to steer the stroller away from the huge birdcage, she started her Oscar winning “get me a pet” performance. 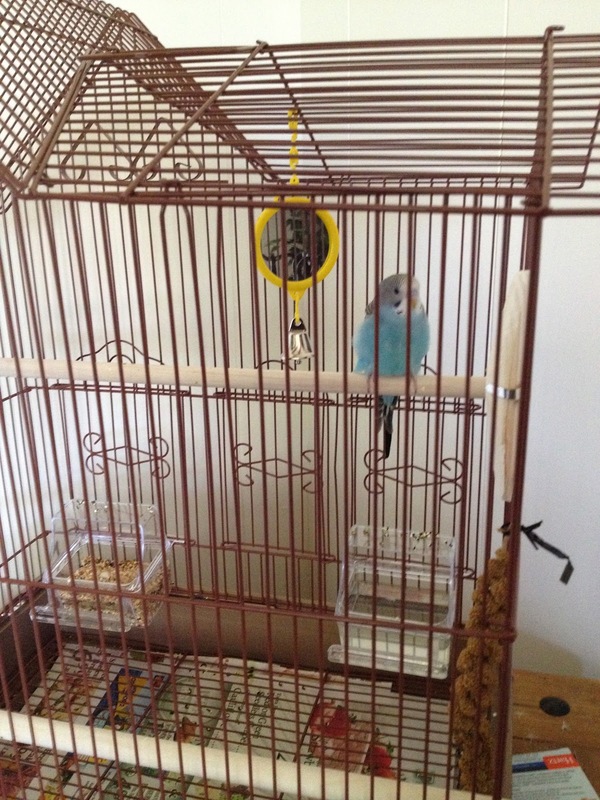 “Mommy, I take blue birdie home,” she said sweetly. I back the stroller out of the narrow aisle near the birds. Gia persists. She wants to take the birdie home. I push the stroller back toward the birds, hoping one more peek at them will do the trick. No such luck. She’s whining now. Bottom lip is quivering. And then…she’s crying and big fat tears are running down her adorable pink cheeks. I kneel down in front of her stroller and explain to her that we can’t take the bird home. Gia continues to alternate between whimpering and wailing that she wants to take the birdie home, until my heart is breaking for her and I agree to get the blue bird. And the funny thing is, I wasn’t getting the bird to shut her up. I was buying her the bird because she was breaking my heart. In the 5 minutes we were there, she fell in love with this blue bird. I picked out a cage and Gia happily selected a toy for the bird and then I told her we needed to get him some bird food. “Bird SEED,” said my good little bird owner. Twenty minutes and approximately $68 later, we were en route to the “new house” with the blue bird. The entire way home Gia talked about her new birdie. “Mommy, I play with birdie. I play blocks with birdie.” I was pretty sure the bird wouldn’t want to play blocks with he, but I didn’t want to burst her bubble. 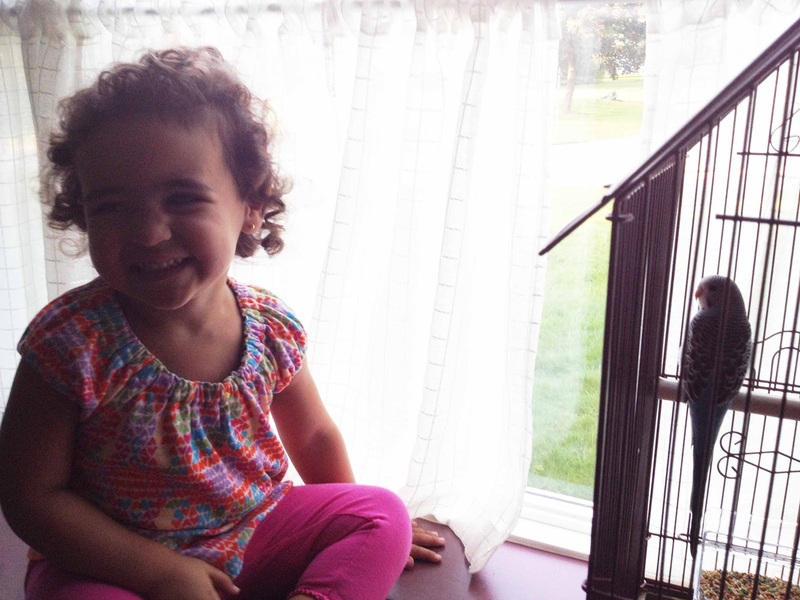 Stay tuned for the big reveal–what did Gia name her bird! ?